The Rock Squirrel is a rodent species belonging to the “Sciuridae” family. They are most commonly found in various parts of the United States and Mexico. 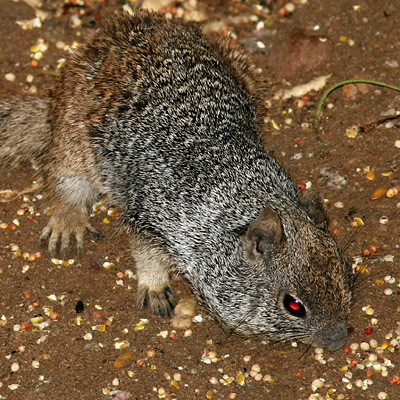 The Rock squirrels are considered to be one of the largest squirrel species. They grow up to a length of around 17 to 21 inches. They have long, bushy tails which grow almost as long as their bodies. The average tail length of an adult squirrel is around 210 mm. The tails are dark in color and have whitish edges. Their backs are covered by a grayish-brown coat which has got tiny speckles of white. The spots occasionally seem to produce a wave-like striped appearance. The gray shade takes a darker brownish black tone on the lower half of the body. The head, shoulders and the rest of the body are often covered with varying amounts of gray or black. The eyes have a light colored ring around them. The average weight of these squirrels lies between 450 grams and 875 grams. The males are larger in size than the females. Rock squirrels are diurnal creatures; they are mostly active during the periods of early morning and late afternoons when the temperature is warm. They tend to be mostly shy and are difficult to spot at close range. They prefer to live mostly in colonies and have a very social nature. A colony will typically consist of a dominant male and several females. The males protect their own groups by fighting with other males. In some cases, a group may also consist of some subordinate males. They give out a sharp, oscillating call when they are threatened or alarmed. 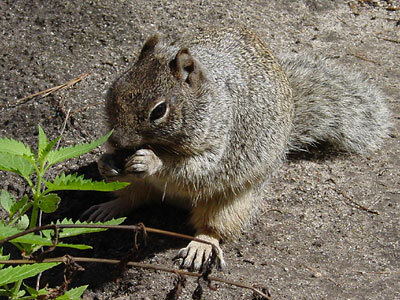 The Rock squirrels are ground squirrels but they can easily climb trees and higher platforms. They have been frequently found on top of junipers, agaves and mesquites in search of food. Rock squirrels normally den in burrows which often tend to be lengthy and complex. The entrances to these burrows are normally hidden behind rocks. They also sometimes choose tree hollows to den themselves. They also frequently hang around on rocky areas such as cliffs, canyons and hillsides. Rock squirrels often store large quantities of food for winter which indicate that they either do not hibernate during the winter months or that the hibernation is short and incomplete. They are sometimes considered as pests due to their habit of destroying crops. Rock squirrels hibernate for 6 to 8 months. The hibernation period lasts from August to February. However, it is believed that their hibernation is short and incomplete as they have been seen foraging above ground on mild winter days. Rock squirrels living in southern areas may not choose to hibernate at all. Rock squirrels are omnivores. They like to eat walnuts, pine nuts, seeds of mesquite, saltbush, cactus, wild gourd, agave, spurge, sumac, cherries, as well as various types of fruits and vegetables. They also love fleshy foods in their diet and prefer insects such as caterpillars, grasshoppers and crickets as well as feed on carrion of dead animals. They sometimes store food in their dens to eat them later. 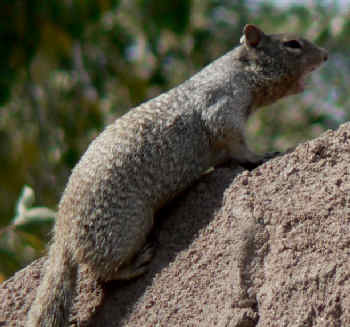 Rock Squirrels are most commonly found in different parts of USA, such as Southern Nevada, California, Colorado, Utah, Arizona, Oklahoma and in the western parts of Texas. They are also frequently seen in New Mexico as well as in various other locations all across Mexico. 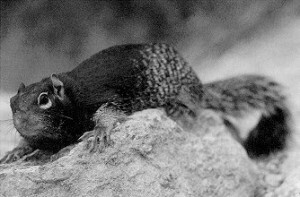 Rock squirrels are mostly found in rocky areas. They are frequently seen grazing on mountainous cliffs, talus slopes, canyon walls, boulder piles, rocks and highway fills. Rock squirrels generally build their burrows beneath rocks. They may choose tree hollows as well for building their dens. The most common predators of rock squirrels include bobcats, coyotes, gray foxes, roadrunners, golden eagles, hawks and snakes. Their bodies are covered with dark brown or black hairs which blend very well with the rocky surroundings of their natural habitat. This helps them to evade their predators. They have sharp claws which help them to dig their burrows or climb on trees whenever needed. Their claws also help them to protect themselves from dangerous predators. They have a strong sense of smell and eyesight that helps them to locate their food as well as sense dangers from a long distance. When they are threatened, they make loud whistling noises that act as an alarm call and alert other rock squirrels nearby. The mating season for rock squirrels extend between the months of March and July. Female rock squirrels normally produce one litter per year, but sometimes may produce two litters. A 30-day gestation period follows mating, which is again followed by the birth of 5 to 7 young pups. The newborn pups have their eyes and ears closed; their bodies are hairless. Lactation period lasts for almost 2 months. They are raised for almost 6 to 7 weeks in nests built out of grass inside their burrows. The young squirrels venture above ground when they are around 6 to 8 weeks of age. The males spend 2 active weeks on the ground after they emerge from hibernation before they get ready for breeding. When two litters are produced in a year, the first litter of pups is born between March and June and the second litter is born between August and September. The normal life span of a rock squirrel is around 1 to 2 years. However, they have been reported to live as long as 10 years in captivity. Rock squirrels are frequently kept as pets. While petting them, it is essential that they should be provided with an environment which closely resembles their natural home. Adequate space is thus a vital necessity for their healthy growth and development. The cage housing a rock squirrel should have the necessary dimensions of 4x6x6 and should be nicely decorated with leaves, grasses, barks and twigs. These plant materials are used by rock squirrels to build their own nests. Rock squirrels should be provided with an adequate diet consisting of walnuts, seeds of mesquite, pine nuts, saltbush, cactus, berries, acorns, figs, fruits and seeds. Their diet should also include insects such as grasshoppers, caterpillars and crickets. Rock squirrels should occasionally be provided with dietary supplements such as calcium powder. The Rock squirrel is listed in the category of “Least Concern” by the IUCN. The Rock squirrels are said to be one of the largest squirrel species. Bones of Rock squirrels found in Salado ruins indicate that there were squirrel settlements even before humans arrived there. They are primarily ground squirrels but they also make agile climbers. Although these squirrels hibernate, their hibernation is incomplete, short and not continuous. Here are some images of the Rock squirrels foraging in their natural habitat. The Rock squirrels are quite active and fun loving creatures that are also very popular as pets. These squirrels form an important part of American ecological system.